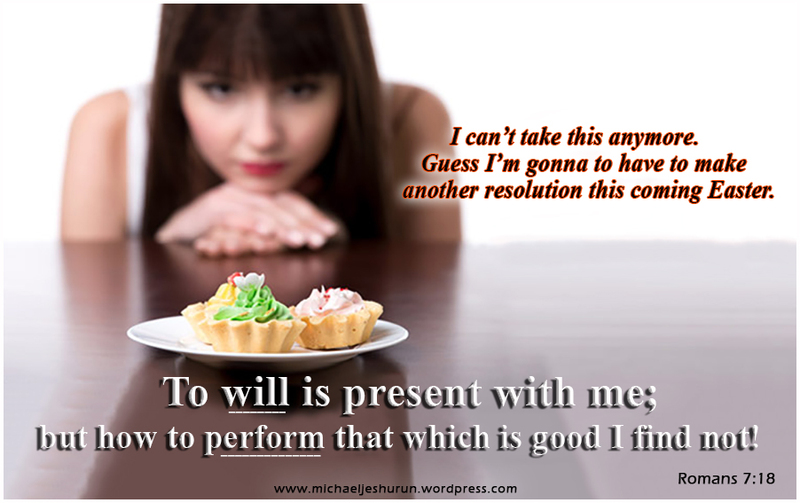 Every ‘resolution’ whether it is on New Year’s Eve or otherwise involves the WILL! But how strong is the ‘will’ of the child of God? Commenting on the above verse in relation to David’s fall with Bathsheba, Pink says – “Note the repeated “I will” in the above passage, and learn therefrom how much the “will” of man is worth”! Think of some of your own ‘resolutions’ . . . Didn’t you say the same thing last year, and the year before? Perhaps this is a good indicator that we have a bigger problem on our hands than just not keeping our vows. The bigger problem is that we’re not very good at doing what we know is for our own good. This should reveal that, lurking subtly behind bad eating habits, persistent debt and slacking spirituality, are character flaws that are not essentially behavioral but existential. Our failures have less to do with WHAT WE DO AND MORE WITH WHO WE ARE. Who would consider it a “meaningful” endeavor to succeed in eating healthy for one year, only to ruin their health in subsequent years? Who would consider it “responsible” to pay off a large amount of debt in a year, only to accrue more debt in the years to follow? These changes we like to see in our lives and vow to make are changes we want to see for the rest of our lives, not just for a year. And that’s probably what most of us intend when we set down our resolutions. But if the CHANGE IS NOT IN OUR BEING, THE CHANGE WILL NEVER BE PERMANENT. Whatever we resolve to do in the upcoming year, we should resolve to be that for the rest of our lives. What we really need are LIFETIME resolutions—because if it’s truly worth doing, it’s probably worth living for. This emphasis on being is important because our actions can only take us to a certain threshold, whereas our being takes the baton and finishes the race. If no “being” is there to greet us, then our actions are just a cumbersome charade, not a way to victory. The kind of victory God desires for us is TOTAL. God wants both our hearts and our hands, our joy and our obedience, our being and our doing. And this not for a year, but for eternity. Our failures have less to do with what we do and more with who we are. But we must address another tempting misconception. Lingering behind the excitement of welcoming the new “me” is the rather misguided confidence in our own ABILITY. We’re tempted to think our characters can be changed in a year simply because WE PROCLAIM IT TO THE WORLD AND WRITE SO IN OUR DIARIES. To this, James would say, ” But now ye rejoice in your boastings: all such rejoicing is evil” [James 4:16]. Our words fail us. So do our deeds. Our hope must be in words and works that do not fail. We need to put our hope in something more consistent, an absolute anchor that wills for us when our behaviors fall short (and they will fall short) [Phil 2:13]. We need our Shepherd right there with us, to help us press on, albeit inconsistently, toward being made complete [Philippians 3:14]. We need take our eyes off our abilities and our accomplishments and look once again at the perfect image we want to be conformed to: the Lord Jesus Christ. He has performed what our behaviors can never accomplish and set us free from the obligation to perform perfectly by His promise to perfect us in His time [Philippians 1:6]. Both by His words and deeds, we know God cares for us more than we can ever care for ourselves. Behavior control is no longer our resolution. To be loved by the perfect love of God is. You’ve probably heard the adage “You can’t turn the Titanic around in a day.” Neither can we turn our characters around in a year. Nor can we do so ON OUR OWN. So, perhaps ADMITTING OUR INABILITY TO PERFECT OURSELVES AND CLINGING TO THE ONE WHO IS STRONG IN OUR WEAKNESS IS A WORTHY RESOLUTION ALL ITS OWN. Paul seems to imply this much when he says, “Let us therefore, as many as be perfect, be thus minded” or in present day English – “Let those of us who are mature think this way” [Philippians 3:15]. Let us all then, as a first step, resolve to think this way!